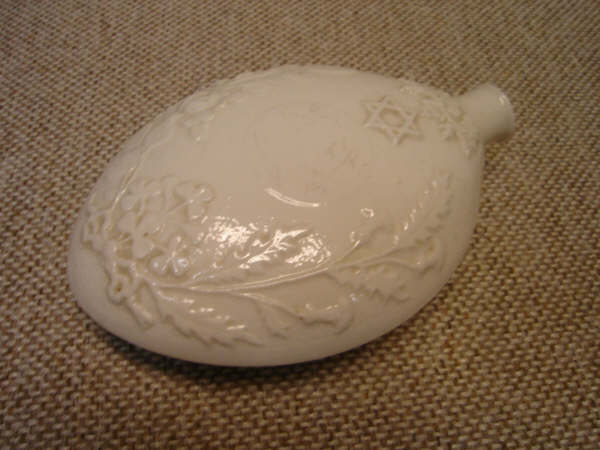 Sotheby's identified the item below as a Belleek Irish porcelain flask from the 1920s. 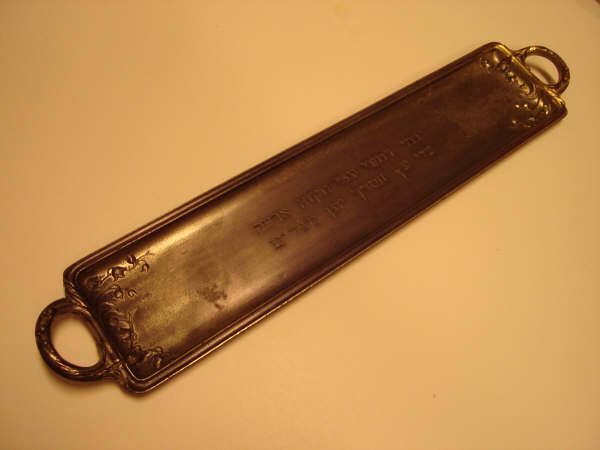 It is 5 1/2 inches long and presumably was used during the brit milah. The item on the right appeared on an auction web site as a drinking flask from the 1880s. 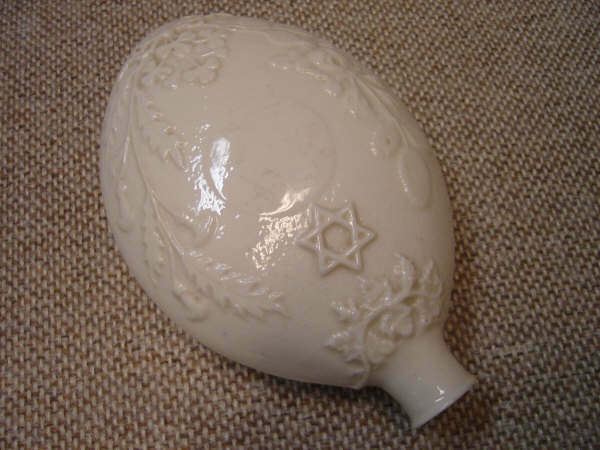 The auction site claimed the flask was made for the Jewish community in Dublin for fundraising. 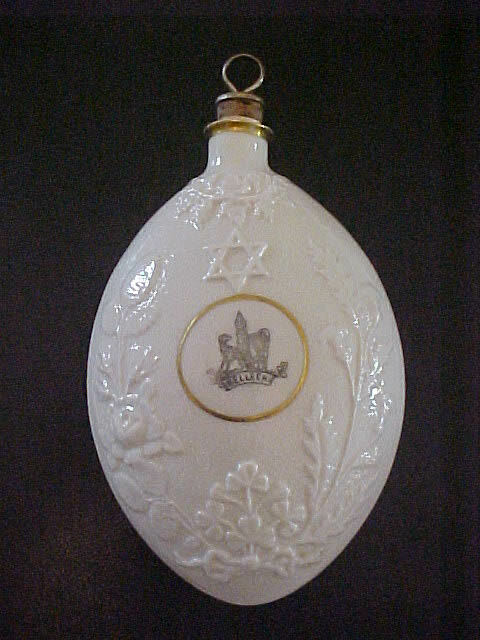 Note the stopper and the Belleek emblem in the center. 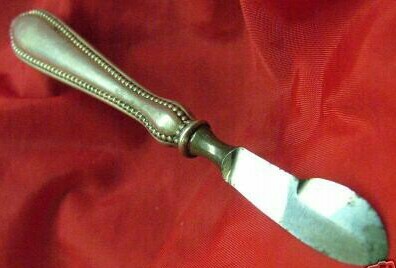 A mohel used this unusual device to sterilize his knife. It was made by Pickslay & Co. in 1902. The pair of knife holders fold down for travel. Unscrew the cap to reveal a wick. The intricate engraving is beautiful. Addendum: the information above as provided by the eBay seller is incorrect. The item is really a curling iron heater. 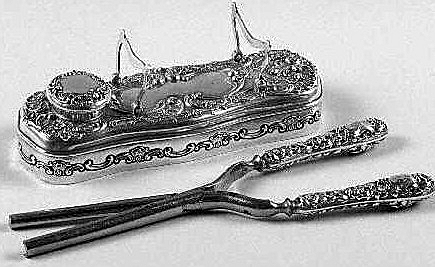 To the right is an example by Gorham Silver. Thanks to Alex Peck for this information. 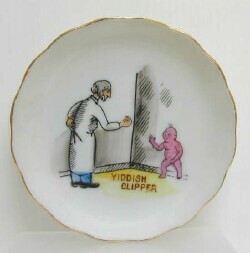 This small plate has a cartoon with the caption YIDDISH CLIPPER. Is this supposed to be funny? Is it anti-Semitic? Or is it a gift for a mohel? If you know the answer, please contact me. 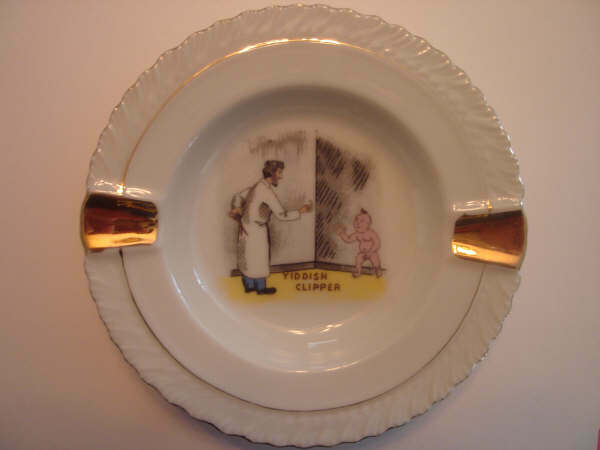 The ashtray has the same cartoon as the plate above. The seller claimed that the item is from the 1930s. 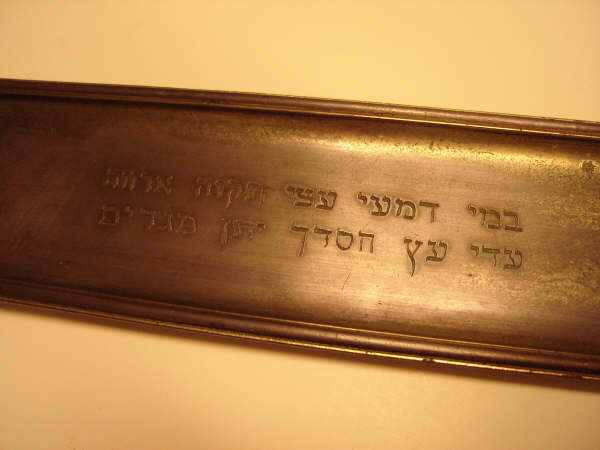 According to the Israeli vendor, this is a pewter tray to hold circumcision tools. It is from Austria, late 1800s. A reader suggested that this tray was used to hold coins for the pidyon ha-ben (redemption of the first born son). The auction house did not make a definite claim that this knife was used for circumcisions. Nevertheless, the blade's shape suggests so. The handle is marked "F&B Sterling" (Foster & Bailey, Providence, Rhode Island). 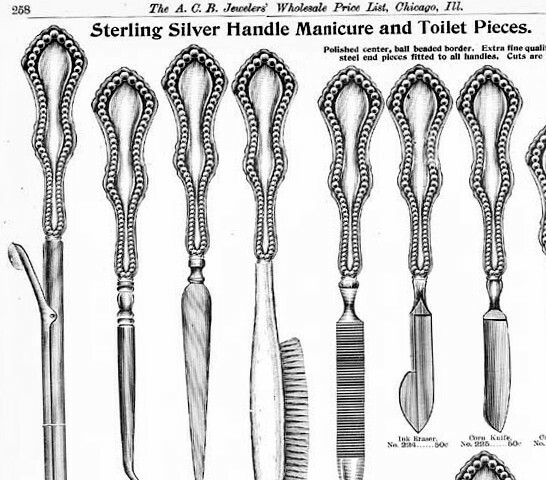 Addendum: it seems that this is an ink eraser, as seen in this 1902 silver catalog. The far-right stamp on this first day envelope cover depicts a circumcision chair. The chair is on display at the Israel Museum. The chair is divided into two parts. One part is the kisay shel Eliyahu (seat of Elijah), where the child is placed first. The second part is for the sandek, the person who holds the child during the circumcision. 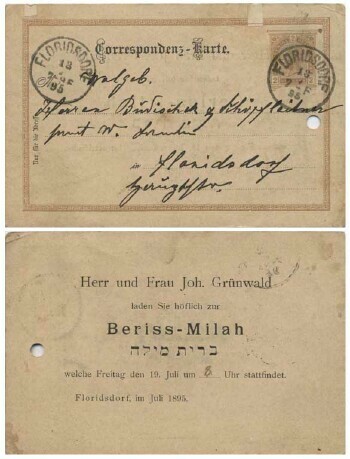 This is a brit milah invitation dated July 19, 1895. The circumcision took place in Floridsdorf, a suburb of Vienna, Austria. The next section is very informative. 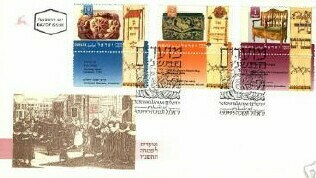 You will learn how to distinguish real Judaica from fakes. Click the button at the bottom of this page to proceed.